^ Sublette, Carey. 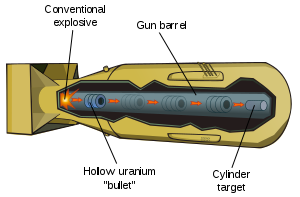 Nuclear Weapons Frequently Asked Questions, Section 8.0: The First Nuclear Weapons. [29 August 2013]. ^ Coster-Mullen 2012, pp. 18–19, 27. ^ Coster-Mullen 2012, p. 18. ^ Glasstone & Dolan 1977, p. 12. Abrahamson, James L.; Carew, Paul H. Vanguard of American Atomic Deterrence. Westport, Connecticut: Praeger. 2002. ISBN 0-275-97819-2. OCLC 49859889. 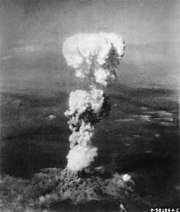 The Atomic Bombings of Hiroshima and Nagasaki (PDF). The Manhattan Engineer District. 29 Jun 1946 [2013-11-06]. （原始内容 (PDF)存档于6 April 2012）. 已忽略未知参数|df= (帮助) This report can also be found here and here. Bernstein, Jeremy. Nuclear Weapons: What You Need to Know. Cambridge University Press. 2007. ISBN 0-521-88408-X. Coster-Mullen, John. 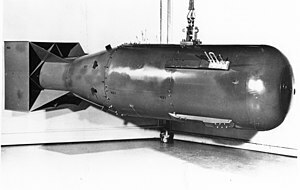 Atom Bombs: The Top Secret Inside Story of Little Boy and Fat Man. Waukesha, Wisconsin: J. Coster-Mullen. 2012. OCLC 298514167. Diacon, Diane. Residential Housing and Nuclear Attack. London: Croom Helm. 1984. ISBN 978-0-7099-0868-5. D'Olier, Franklin (编). United States Strategic Bombing Survey, Summary Report (Pacific War). Washington: United States Government Printing Office. 1946 [6 November 2013]. This report can also be found here. Genetic Effects: Question #7. Radiation Effects Research Foundation. [2013-11-06]. Glasstone, Samuel. The Effects of Nuclear Weapons, Revised Edition. United States: United States Department of Defense and United States Atomic Energy Commission. 1962. ISBN 978-1258793555. Glasstone, Samuel; Dolan, Philip J. The Effects of Nuclear Weapons, Third Edition. United States: United States Department of Defense and United States Department of Energy. 1977. ISBN 978-1603220163. Gosling, F. G. The Manhattan Project: Making the Atomic Bomb. Diane Publishing. 1999. ISBN 978-0-7881-7880-1. Groves, Leslie R. Now it Can Be Told: the Story of the Manhattan Project. New York: Da Capo Press (1975 reprint). 1962. ISBN 0-306-70738-1. Hansen, Chuck. Volume V: US Nuclear Weapons Histories. Swords of Armageddon: US Nuclear Weapons Development since 1945. Sunnyvale, California: Chuckelea Publications. 1995. ISBN 978-0-9791915-0-3. OCLC 231585284. Hansen, Chuck. Volume VII: The Development of US Nuclear Weapons. Swords of Armageddon: US Nuclear Weapons Development since 1945. Sunnyvale, California: Chuckelea Publications. 1995a. ISBN 978-0-9791915-7-2. OCLC 231585284. Human Shadow Etched in Stone. Photographic Display. Hiroshima Peace Memorial Museum. [2013-11-06]. Izumi S, Koyama K, Soda M, Suyama A. 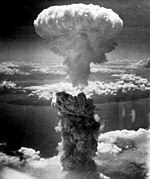 Cancer incidence in children and young adults did not increase relative to parental exposure to atomic bombs. British Journal of Cancer. November 2003, 89 (9): 1709–13. PMC 2394417. PMID 14583774. doi:10.1038/sj.bjc.6601322. Izumi S, Suyama A, Koyama K. Radiation-related mortality among offspring of atomic bomb survivors: a half-century of follow-up. International Journal of Cancer. November 2003, 107 (2): 292–7. PMID 12949810. doi:10.1002/ijc.11400. Jones, Vincent. Manhattan: The Army and the Atomic Bomb (PDF). Washington, D.C.: United States Army Center of Military History. 1985 [25 August 2013]. OCLC 10913875. Malik, John S. The yields of the Hiroshima and Nagasaki nuclear explosions (PDF). Los Alamos National Laboratory report number LA-8819. 1985 [6 November 2013]. Rhodes, Richard. The Making of the Atomic Bomb. New York: Simon & Schuster. 1986. ISBN 0-684-81378-5. OCLC 13793436. Rhodes, Richard. Dark Sun: The Making of the Hydrogen Bomb. New York: Touchstone. 1995. ISBN 0-684-82414-0. Richardson, David; 等. Ionizing Radiation and Leukemia Mortality among Japanese Atomic Bomb Survivors, 1950–2000. Radiation Research. September 2009, 172 (3): 368–382. PMID 19708786. doi:10.1667/RR1801.1. Samuels, David. Atomic John: A truck driver uncovers secrets about the first nuclear bombs. The New Yorker. 15 December 2008 [30 August 2013]. Serber, Robert; Crease, Robert P. Peace & War: Reminiscences of a Life on the Frontiers of Science. New York: Columbia University Press. 1998. ISBN 9780231105460. OCLC 37631186.